Like any long-term relationship that has lost its intimacy, it's easy for commuters to fall into a love/hate bond with GO Transit. In my case, after a decade of begrudging virtually every minute I spent on the train, GO Transit and I finally found a happy rut last year with the opening of the new West Harbour station. West Harbour GO is a convenient little station in my neck of the woods on James Street North. A longstanding (and long-delayed) promise to build a station there was one of the reasons my partner and I moved into the Beasley neighbourhood in 2006, and why my family stayed nearby when we moved to the North End in 2014. 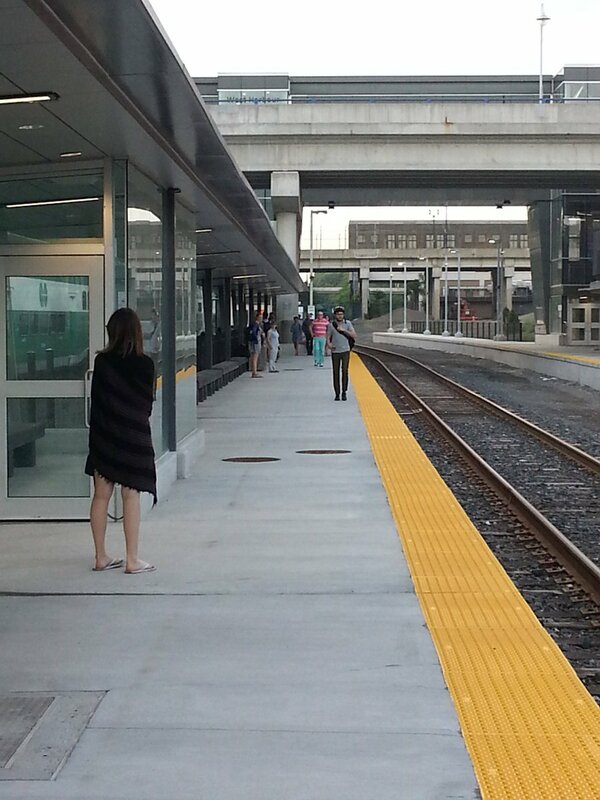 The station opened to some fanfare, just in time for the 2015 Pan Am Games. But after a year of lulling us into West Harbour's sweet embrace, and right on the heels of the Province's announcement of new stations to increase service for Toronto riders, GO Transit is now pouring cold water on West Harbour commuters with a series of curse-inducing schedule changes that may seriously impact ridership at the lonely new station. Credit to Stevan Garic, who turned GO Transit's unwieldy schedule update announcement into something riders could actually understand. Starting next week, the only two weekday outgoing trips from West Harbour are moved up to 6:09 AM and 6:39 AM. For the seasoned commuter, the seven minutes shaved off the old schedule will mean some bleary-eyed mornings, but being forced onto an earlier train is as familiar to a Hamilton GO rider as shouldering the ubiquitous fare increases. The real pain starts when looking at the options coming home from the Big Smoke. The glorious 4:47 PM train that got us beleaguered souls back to Hamilton just inside of 6:00 PM is gone. We should cheer this, say the Bombardier-employed "Customer Service Ambassadors", because GO "listened" to us by not cancelling the 4:30 PM train to Hunter Street. A crazy-early and unfathomable 4:00 PM express train serving West Harbour was added, though, and the two students who can ride it are surely happy. While I'd love to have the same level of work-day flexibility enjoyed by the Metrolinx planners, virtually every other commuter I know has to stick around the office until at least 4:00 PM, making that trip particularly unhelpful. Thankfully, this time GO schedules have been aligned with HSR's summer changes so that, even though both West Harbour trains are long-gone before the #20 A-Line Express begins service, the #4 Bayfront now serves the North End as a reasonably-timed feeder route to the station, and the #2 Barton continues to offer ten-minute service from the east and south. West Harbour's commuters are a small but growing group representing just a small piece of the GTHA's regional transit ridership: in April, CHCH reported that only 33 people using the two early-morning trains. Just this week, CHCH returned and reported from West Harbour at rush-hour, offering viewers images of an empty courtyard in front of the station. Though my personal counts suggest a higher ridership on the return trains in the afternoon, especially on the 4:47 PM train, it's hard to make a case that the West Harbour station has been a prudent and useful investment of $58 million, or that it's even modestly improving regional transit. When the station opened last year, it presented an opportunity for the North End, Central and Beasley neighbourhoods to become bedroom communities for Toronto-bound workers. And indeed, large price-increases for nearby homes suggest that the area is becoming a haven for refugees from Toronto's hot housing market. But service levels matter, and so long as GO Transit insists on running only two poorly-timed trains a day to/from the station, on schedules that bear no resemblance to a rider's actual workday, we are bound to see more images of a barren station. It's bad enough that all-day GO service appears to be way off on the horizon, but after only a year, the existing service to West Harbour has been signficantly weakened. Like many West Harbour commuters I've spoken to since the changes were announced, my commute will soon be 15-20 minutes longer. Due to the disappearance of a well-used rush-hour train, it is almost certain that many current West Harbour commuters will be piling onto the very-crowded 4:30 or 5:00 PM trains to Hunter St. station, and then using Hamilton Bike Share and/or HSR to get home. Hopefully Metrolinx is monitoring the effects of these inconvenient schedule changes, as they seriously put a dent in the vision of a well-integrated community transportation hub. Hamilton deserves better than this step backward on service. Because, I want to love you again, West Harbour Station, I really do. But you're making it awfully hard. Good little write up that needs to be publicly known -- I understand it may be temporary (due to Hamilton Rail Junction construction and the Union track closures). This is why the schedule inconveniently changed temporarily. Hopefully the schedule dramatically improves coming 2017, as my ongoing investigations indicates it should. The station opened very early for its big-future-plans. Even as early as 2012, it was already known it would take until 2017 to complete the station. Media and PanAm just hyped 2015, but the real station isn't finished yet. Right now, my research indicates Victoria's Day 2017 is the probable "Betting Man's" start date guesstimate of Niagara seasonal GO trains stopping at West Harbour GO. This is no guarantee obviously that would happen, but, I've been visiting four construction sites with ongoing work and all sites completes by then. The image below is a teaser that is part of GO Part 3. 2016 (mid-late): Completion and connection of Lewis Yard to the CN mainline. Funded (2017-2019) is extra track going between West Harbour and Stoney Creek GO station and possibly the Lewis Yard. However, before then, there is supposed to be West Harbour GO reconnection of station track to the CN mainline -- supposedly by end 2016. Construction on the CP side (Hunter) may occur between now and ~2025 but currently none of them are budgeted or funded, and the tunnel is an expensive proposition. CN only has 2 trains a day on the Grimsby sub, and CN has been much more of a pleasure for Metrolinx to work with, given all the great developments relating to CN track (Kitchener, etc). I envision Metrolinx eventually being forced to switch all-day GO service to West Harbour GO. Given the fact, according to the Metrolinx 2011 Niagara ESR Appendix (on freight corridor compatibility with 60-minute all-day service) -- the West Harbour GO route gains "technical capability" of all-day 2-way GO train service as early as 2017. But it needs to gain enough ridership (e.g. via Hamilton LRT A-Line) to justify the business case of paying CN for every train trip to West Harbour GO. The bottom line is that West Harbour GO traffic is slated to dramatically increase roughly beginning next year or two (bus connections, Niagara connection, more West Harbour trains once Lewis Yard opens). And yes, it is Metrolinxs' onus to do it quickly, to help justify Hamilton LRT A-Line better. A very sad surprise would be the continuance of 2 trains per day for many years to come, and the planned John Street bridge rebuild putting the kibosh on Niagara trains stopping at West Harbour, and a Hamilton LRT cancellation wrecking West Harbour GO's future plans for a long while. My prediction is middle ground -- 4 trains a day (including a late morning train) by 2017/2018/2019, and Niagara Seasonal trains by 2017 season. Metrolinx will strategically warehouse the "technical capability" of all-day GO service for later activation (operationally possible 2017 for WH, but not necessarily business justifiable without Hamilton LRT). Factors like Niagara-Hamilton Express, Hamilton LRT shovels, etc, will improve the business case for all-day 2-way GO service -- to anywhere between 2017 and 2024, and could happen sooner especially if the Hunter option (CP negotiations) is clearly failing to bear fruit. 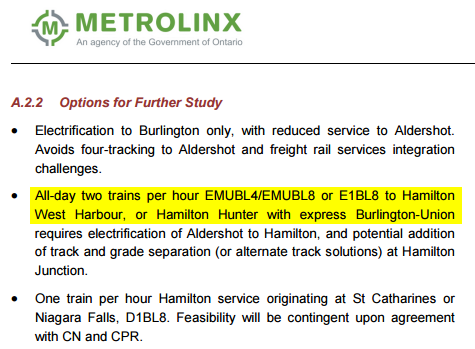 The silver lining in all of this, is, Hamilton, does, indeed, have an option (escape hatch) of being able to provide all-day GO trains to Hamilton even if CP negotiations fail (Hunter). Even the Rail Junction expansion goes above-and-beyond the minimum requirements (in 2011 Niagara ESR document) required for theoretical 60-minute all-day 2-way on the CN side. The Rail Junction expansion only helps West Harbour, and not Downtown GO. While Metrolinx/GO definitely prefers Hunter for all-day, their bets are clearly being hedged (even as late as 2016) [from RER Business Case documents] on using West Harbour for all-day. Either way, the current 2016 West Harbour GO schedule is a temporary inconvenience -- agreed. And without the parking garage built yet, most drivers (especially already on 403) will head to Aldershot. At least they kept the 4:30pm train -- it was actually going to be worse..
Watch for Steven Del Duca to set up a press conference at the West Harbour plaza. When? Anywhere between now and 2017 -- my coin flip says July 2016. ...I would suggest seriously considering the possibility of all-day West Harbour GO train service activated before the 2018 election. This will (1) cement Big Move plans, (2) reduce opposition to Hamilton LRT, (3) make it more likely for GO electrification to happen all the way to Hamilton sooner (as a future Phase 2). Thanks for the insight, Mark. I'm getting a little weary of hearing "temporary" in reference to potentially years-long plans (blame my recent experiences with Hamilton Health Science's attempt to get a 15yr "temporary" parking lot in Beasley), but at least it's not permanent. Also I'm not sure I'll be cheering Metrolinx not cramming us onto even BUSIER trains by killing the 4:30 AND 4:47 train, the same way I shouldn't have to cheer when a train actually gets me into TO for 7:59 as advertised. But I get the point. All in all, I'm not too eager to forgive GO on this one--the announcement was intentionally buried and done at the last minute. As of this AM I was still meeting colleagues on the train who had no idea the 4:47 was cancelled. Monday is going to be a painful surprise for some folks. Finally! Those of us who work earlier than others will be able to benefit! I'll definitely be testing this out now since I will be able to try it on my 7-3 schedule. See, it isn't all doom and gloom. While you may not benefit, others will. Definitely test it out--it's a great little station, that West Harbour. Glad you're one of the two people cheering the new sched, but sounds like folks on the 7-3 shifts are getting the same short-shrift as everyone else. The day riders can go back to departing/arriving from the same Hamilton station without artificially extending their work day will be a good day for all commuters. Most run 9-5 but there are a lot of 7-3er's who'll find the early train a boon. Hopefully once Lewis is dully operational, new trains will be added that spreads all the time options out, from 5am through 8am. I personally prefer a 7:45am option arriving Union 9am if one existed. Agree fully. Waiting anxiously for all-day GO from Hamilton to Toronto - express and all stops. I would really benefit from bus service from Hamilton to Square One running at decent times. But I'll take what I can get. One of the big issues GO Transit has had is vertical versus horizontal expansion of its rail routes. Having trains coming from Hamilton or even further a field like St. Catherines or Niagara to Toronto (Horizontal Expansion) makes the effect of any slow down due to construction or service interruption, become multiplied and cause further problems down the line. Adding more trains (Vertical Expansion) means a more complicated schedule with problems and issues multiplied through distance. After many bear/shot fueled conversations with European colleagues about GO's issues one night, one fact was very clear. The real issue isn't at the Hamilton, Barrie or Oshawa end its at the Union Station end. However many new GO lines and service expansion on existing lines we eventually are able to do its still ignoring the fundamental problem, Union Station. Without a Union station redevelopment on a truly titanic scale, Union Station is really just running out of capacity, for more passengers and trains. Go Transit has hinted at it but what I think they really need to start doing is building a second downtown railway station of significant size and scope. The Bathurst coach storage yard has been discussed as a possible new downtown station but its capacity and scope will be limited. For example, any serious problem with frozen turnouts (switches)in super cold winter weather leading to or from Union turns into a huge issue for multiple GO train lines. The longer the line the bigger the headache for GO Transit and its passengers. The chief investment that needs to be made IMHO, is a second or third downtown Toronto Commuter Railway Station with semi or completely separate approach tracks from Union Station. Also a real building, good design not just a commuter platform like West Harbor GO and a separate coach storage yards. The new station or stations must also be linked by TTC subway services and underground pedestrian connections to the PATH system. Expensive, yes it would be. Complicated and time consuming, you betcha! However, its becoming quite clear that it will be desperately needed. With GO RER/Smart Track, a new possible Bolton GO Rail Line and access for the Shinning Waters Railway based commuter trains from Peterborough, as well as any attempt at high speed rail access to Union, it has become very clear that the number of trains entering Union will just be, too high. It will also become very hard for the passengers to deal with the crowds at certain pedestrian choke points, trying to access connecting intercity rail and transit services. "Without a Union station redevelopment on a truly titanic scale, Union Station is really just running out of capacity, for more passengers and trains." This be true. What they're doinng is a step towards this, although not the titanic scale. There is currently a plan to almost double train throughput at Union station, to around 49 trains per hour by 2031. I am aware of the plans to upgrade the USRC to 45mph approaches on the west end and 30mph on the east end. But they have postponed this work until electrification (at least). The messed up part was they have repeatedly re-tendered the USRC work 3 times already and now the "big stuff" (that will increase Union throughput) is postponed until electrification. With faster approaches before slowing down to the edges of the Union platforms, as well as shorter dwells, plus the addition of Platform 28, and possibly track-sharing with VIA (they left blank-in provisions for a Platform 13/14 stairway in the new concourse -- right now it's the area that displays phamphlets and schedules), and the roughly doubled train throughput, they will have more flexibility but they are going to push that flexibility to the very limits. Once the new concourses open and the basement mall, there will be about 6x the amount of loitering space than pre-Union-revitalization (3x concourse space, plus the lower level mall). The choke points will definitely be the stairways. Some of them will need to be widened 6 inches (without widening exteriors) to massively improve throughput: That allows them to be double-file stairways, and allows people to go downstairs while going upstairs at the same time. Doors/entryways of some stairs need to be widened to be double-file, they are choke points, and will require optimizations later on. Some of them already have, but some birdbrain moves were made like protruding staircase handles more than necessary (since there were no bulkheads), but it was pretty clear several stairways fully capable of douible-file are running in single-file mode due to being a few inches to narrow, causing problems with people going downstairs versus going upstairs. And a single standard door can't be double file, creating a choke point at the top or bottom of the stairs during high peak where there's counter-commuters trying to fight the way in opposite direction. Beyond that, titanic redos would be needed like the tunnel. Also, worth noting is GO wants the CBTC system (RER Business Case) which is a moving-block system instead of a traditional rail block system, which shortens headways. Trains follow each other at braking distances, rather than a traditional fixed-block system (except as fallback). It appears that about $800 million dollars of the already funded $13.5 billion electrification, is for the system that shortens train headways (page 161 of GO RER Business Case). CBTC is mentioned many times by Metrolinx in recent documents, as being critical to GO RER. "makes the effect of any slow down due to construction or service interruption, become multiplied and cause further problems down the line." That would appear to be true. This is part of the problem, the GO/RER system by itself at peak will be responsible for 32 trains and hour. That's not counting the other non upgraded GO lines plus Bolton and the planned Brampton Shuttle via the old CP Owen Sound Subdivision (now the Brampton Orangeville Railway), VIA Rail, Shinning Waters Railway and finding somewhere to put in a high speed access route. Really 60-80 trains an hour capacity is what is really needed during peak. 49 Trains an hour in 2031 is just not enough. Plus many of the links that passengers need aren't big enough. Yes we have nice new waiting rooms for GO passengers but still a relatively low capacity connection to the expanded TTC Union station subway platforms (although it is an improvement to what was there before). Any improvement to the Harborfront LRT platforms at Union will increase pedestrian connection problem to the railway part of the station complex. VIA Rail and any Intercity High Speed Line will require a massive increase in luggage and package handling capacity. Any extra space for that was given away for a shopping mall. The station that houses the intercity trains must also have a built in customs facility for pre clearance of passengers traveling to the US and making the border trip a lot faster (it will almost eliminate the 1-1.5 hour wait at the border). The CN/CP/GO Railway Police need there police station facilities back. The railway police station (3rd largest police force in Canada) used to have a station including a holding cell all at Union plus a shooting range that was removed by the city of Toronto. Those are now Metrolink offices. I really do want to have a new type of commuter rail system that GO RER and even Smart Track represents but the change is going to painful. For example, one problem/issue is that any signaling system that greatly reduces headway on the national railway system is also running a foul of most of the safety training and procedures that engineers operating trains on mainline railways in Canada (including GO Transit operators) must follow. The problem really amounts to the safety procedures and rules being written for a system with the pace of a freight and or long distance passenger rail system, while needing a commuter rail operation with a rapid transit, operating pace. The 2 do not work together at all! I see a lot of safety and procedural conflict coming between GO and Transport Canada and the rest of the North American Railway Industry. This was always my big worry about GO RER and Smart Track because it relies so much on altering quickly, very, very quickly altering in a coherent way, a century of government and industry rules and regulations, virtually overnight. You can't make this legal for GO or Smart Track and still say you can't have things like Tram-trains combined with LRT. This leaves a lot of freight railway businesses left behind as well. If passenger rail services can change a century of safety procedures overnight, why can't freight rail services! Then you get in a even worse problem. For example, one problem/issue is that any signaling system that greatly reduces headway on the national railway system is also running a foul of most of the safety training and procedures that engineers operating trains on mainline railways in Canada (including GO Transit operators) must follow. The problem really amounts to the safety procedures and rules being written for a system with the pace of a freight and or long distance passenger rail system, while needing a commuter rail operation with a rapid transit, operating pace. The 2 do not work together at all! I think the rules are about to be changed within 10 years thanks to Trudeau et cetra. Let's consider that they had a waiver for the Ottawa O-Train (a $21M diesel LRT run as a 5-station trial on an existing mainline). But now we're witnessing 2 orders of magnitude of spending (>$20billion) in the combination of $13.5bn GO RER (funded), the $5.5bn Montreal mainline light metro proposal (funded by Caisse and a little of Fed/Quebec pitch-in, apparently very close to being funded), and the $4.3bn VIA HFR EMU proposal (study now funded by feds, likely completed late this year or by next year). All of which will require rule changes with $20bn+ of standardized 25kV mainline catenary spanning Aldershot-Toronto-Ottawa-Montreal and lot of spurs (Toronto GO RER, Montreal Caisse light metro), with most of these proposals entertaining non-FRA trainsets (GO RER isn't the only party...). Not to even mention the freight bypass may become a reality, freeing 100% of Kitchener rail to 100% passenger use and electrification to Kitchener-Waterloo by 2024 (...That is defacto the 407 Freight Bypass with the CN-side requirements satisfied -- and admittedly a fairly aggressive date to build the 407 Freight Bypass, IMHO...but CN is already 100% onboard [tweet2, tweet3]...and the feds appear to have their wallet ready). On top of this, the Kitcheern electrified GO train route is likely also the same route the Ontario high speed rail study currently in progress, will likely run over. It will be interesting to see what congruencers comes up with GO trains and high speed trains, and whether. The proposal is coming out October 2016. Given the infrastructure-happy politics going on occuring, we might end up seeing high speed rail within our lifetime. One possible outcome within twenty years, I see, is something Acela Express style -- "lite" 200-240kph league rather than Japan/France 300kph league -- defacto high speed GO trains as a merger of GO electrification and high speed trains, into a "lite" high speed train that serves both commuter and intercity needs. Not all of these may pan out, but even if half of all of the above happens in the next 20 years -- this is a massive electrification of Canadian rail infrastructure requiring seismic Transport Canada changes. Which, obviously, is going to have to include the train's own structural strength & modern signalling systems. Seismically, the large number of mainline electrified train initiatives, means this is going to heave Transport Canada towards operating rule changes for CBTC-equipped corridors. From what I'm aware of from reading the docs (below) EMUs will be only coming to the Bramalea/Aurora/Unionville lines initially, and not to Lakeshore East/West (which will be electric locomotive driven initially). So they only need to focus on the Transport Canada waiver for those lines (as well as ferry to the railyards, e.g. Whitby). So the deployment of new operating rules could be done incrementally, possibly as an overlay on traditional blocks -- e.g. If CBTC is operating, operating rules may give permission to allow multiple trains to occupy the same block. This is already permitted with railyard rules where you see 2 or 3 trains creep slowly only meters apart at Mimico in the late morning, while they're deadheading into Willobrook. I would imagine that CBTC would allow the trains to follow each other faster within the same traditional block. I imagine traditional blocks will continue to exist for a long time as a fallback. A CBTC failure could automatically cause all trains to brake unless they were able to fallback to a traditional block system and the train was the only one in a series of otherwise clear blocks (e.g. only train). There are probably a lot of complex nuances to solve, before Transport Canada lets all of this happen, and I imagine it has to happen incrementally, one track in one corridor at a time (probably beginning with the electrified version of UPX which is already equipped with PTC, although as far as I know, it is only active at the station end to prevent the train crashing into the end of the line). I also have an UrbanToronto thread on PTC/CBTC signalling coming to the electrified version of GO's network, as it's a fascinating matter to watch coming to Canada's railroads in the light of the multiple electrification developments happening (including other than GO RER). 126 jobs are being created in Ontario for the CBTC signalling system, thanks to an Ontario $12M grant and $80M investment. Other companies including Bombardier are biting too as well. It would seem that a seismic move at Transport Canada is occuring between now and 2025(ish), but the above indication of flexibility is a huge indication towards this direction. It might happen slowly, a few fully-grade-separated lines at a time. Given the huge order of magnitude of funding on electrified rail initiatives ($20-$30bn, of which $13.5bn is funded and $5.5bn apparently close to being funded) all possibly simultaneously depending on new Transport Canada rules -- you can bet Transport Canada is working on eventual new operating rules for this new era. Yes, the O-Train did get a waiver but they still took 5-6 months to make sure the boys and girls at the National Capital Railway were put through there paces (The National Capital Railway is a wholly owned division of O.C Transpo and a federally regulated railroad). It got special permission because there were less than 3 freight movements a week on the line and they were mostly night and early morning trips. Although, I personally saw one freight going down the line passing by at Greenboro station one afternoon a couple of years ago, delivering a rail vehicle to the rail testing facility at Leitrim (it was one of Toronto's new Streetcars). I have no doubt that TC (Transport Canada)is under pressure to change. The Mayor of Toronto for example called out TC a few years ago for challenging Smart Track after the Prime Minister (Harper) had made promises for funding. The problem, TC was gutted by Harper. TC took some of the biggest hits in all of the federal government cuts, in terms of the shear number of layoffs and the number of staff made redundant (jobs will not be replaced). Not counting Coast Guard cuts, which is also a Transport Canada responsibility, 2100 jobs were made redundant at TC and temporary layoffs numbered around 1000 this just in Ottawa alone. When a new train design is introduced to Canada that has never run here before, its TC's job to check it out and make sure it can legally run on Canadian Railroads. It took TC 15 months to check out and make legal, Ottawa's new fleet of Alstom's Cordia Lint 41 DMU's for the Trillium Line (The old O-Train Line). It only took 5-6 months to check out and make legal the original BR 643 Talent DMU's back in 2000. The reason given was the lack of staff to do the job! The actual approval process was slightly faster, 4 months for the new Lint 41 DMU's than took for the Talents. However because they had so few staff the trains sat outside waiting for a year in O-Train's storage facility at Walkley Yard before TC had enough staff to do the job. This is only one of the new realities at TC and the new government under Trudeau said there will be no hiring binge in the Federal Government to make up for the enormous cuts of Harper's government. So yes I really want some institutional change at TC but I won't hold my breath. With a trip time of roughly only 45 minutes (or so) between West Harbour and Union after going express beyond Burlington, the Hamilton 16 Express would no longer be needed. By the time this is funded and happens with all-day 30 minute service, we'll already have a Hamilton LRT connected to this. And this GO network would by then be connected to VIA's electric HFR network that connects to Montreal's electrfied light metro/commuter system, the Ottawa LRT, Kitchener-Waterloo LRT, etc. Not to mention the possible high speed corridor (Toronto-Kitchener-London) and all the various Big Move projects. The European-style "network effect" (electrified Ontario/Quebec) means many people can decrease reliance on their cars, with more ability to be mobile through the urban corridors. Reducing the need to widen freeways further or avoid doing things like building Pickering Airport (Mirabel 2), etc. Steven Del Duca is about to announce something related to Hamilton/Niagara today. One could dream and this announcement is all-day 2-way GO service coming to West Harbour GO station in 2017-2018 -- it becomes technically capable of that. But it's probably one or two of the above. Let's see. It's worth knowing this earlier article: Niagara Smashes Through Barriers to GO Rail Expansion .. which foreshadowed this announcement and I think this is the announcement Niagara has been waiting for. Finally, "The" announcement. I've been kind of holding back GO Part #3, for what looks like a big announcement that I already know will also majorly affect Hamilton GO service. Keep tuned for an RTH submission to follow up. Whatever train this is, it's stopping at West Harbour. West Harbour GO station is not included (yet). Takeaway is they are politically hedging Hamilton due to the current LRT uncertainity. We can blame quite a few politicians for influencing Metrolinx making Confederation GO the terminus instead of West Harbour GO. Today's announcement is consistent with the Niagara Express service concept -- a train that goes between Hamilton and Niagara. In an ideal future, Niagara Express trains would use West Harbour GO as the terminus, with a fully connected A-Line LRT. Perhaps that's a 2024 terminus extension of the Niagara-Hamilton-only train from Confederation to West Harbour GO, to be announced once the LRT is safely under construction. Track improvements New and upgraded rail stations A new layover facility in Niagara Falls Additional GO rail fleet to provide service along the corridor Adding more than 30 kilometres of new track. Three other stations are proposed along the corridor in addition to the Confederation GO Station - a new station on Casablanca Boulevard in Grimsby as well as upgraded VIA rail stations in St. Catharines and Niagara Falls. Quick Facts The Niagara Falls GO rail extension will operate on approximately 60 km of track between the future Confederation GO Station in Hamilton and Niagara Falls. Construction on the new Confederation GO Station in Hamilton is expected to start in 2019, with completion expected in 2021. Since 2003, Ontario has extended GO’s rail network by nearly 90 kilometres, opened 14 new GO stations, rebuilt four existing stations, and added more than 31,000 new parking spots across the system. Metrolinx is transforming the GO rail network to provide faster and more frequent GO train service across the region, with electrification of core segments of the network. Weekly trips across the entire GO rail network are expected to grow from about 1,500 to nearly 6,000 over 10 years. This might be suggestive of all-day 2-way Hamilton-Toronto train service by 2021 -- to connect to this aforementioned Hamilton-Niagara-only train service. Instead of West Harbour only, Lakeshore West might be extended to also make a stop at both West Harbour and Confederation. This newly announced Hamilton-Niagara GO train does not go to Toronto -- it goes back and fourth between Confederation/StCat (2021) and extended to Niagara by 2023. As far as I know, this is the first-ever GO train that doesn't terminate in Toronto, but Hamilton instead -- it uses Hamilton as a GO train hub. This suggests Hamilton becomes a new GO train hub in the 2021-2024 timeframe. This also strengthens the business case (and my prediction) for making West Harbour GO the all-day terminus, instead of Hunter GO. UPDATE! Good news. Confederation is still on track. It was a press release error. Mark, do you anticipate that any of those "investments" will survive a government change? Now that the leader of the opposition is from Barrie, not Niagara, will there be much enthusiasm for a GO line on a route already traced by the least congested part of the QEW? My suspicion is Steven Del Duca will be setting up a podium at West Harbour GO sometime between now and end of summer. Some kind of announcement would occur, like the opening of the under-deck parking garage (appears to be almost complete, from my last visit). We can have a better idea. Take a read of Steven Del Duca's piece in a Niagara paper -- some Hamilton related information is also included within. A great surprise would be the pre-announcement of Lakeshore West all-day 2-way service being extended to Confederation station. The West Harbour could begin accepting this service possibly as early as 2017, although it is probable they need to test-out the infrastructure first with incremental service increases before they make such an announcement. Iron out the bugs with the Rail Junction, Lewis Yard, transit service on old CN tracks (before the new track being constructed by 2019 for Stoney Creek GO). But if they are feeling confident, negotiations with CN is going well, then perhaps they can pre-announce hourly all-day GO service (extending every other Lakeshore West train to West Harbour GO). 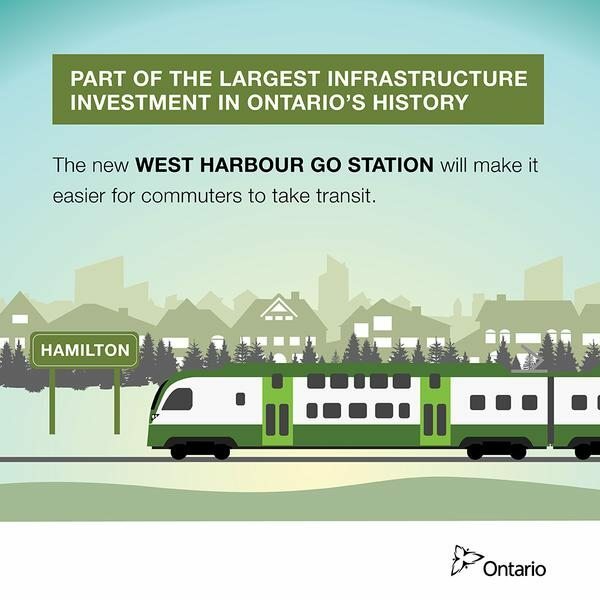 It is really truly apparent that West Harbour is the station destined for all-day 2-way GO service, with the huge number of kilometers of track being constructed (West Harbour GO funded budget + Confederation GO funded budget + Niagara extension pledged budget), and zero on the CP side of things. In fact, I recently discovered that the Hamilton Rail Junction expansion actually slightly hurts Hunter GO -- the new track/switch arrangement heavily favours throughput into West Harbour, while slightly hurting flexibility into Hunter. Very telling... very. Not to mention, the quote in the July 28 Metrolinx meeting agenda, "and rail corridor expansion projects including bridges, retaining walls, and track and signal improvements required to provide future two-way-all-day service to Hamilton." -- guess what, all of that is only on the CN-side (West Harbour). Everytime I commute to/from West Harbour, I see the brand new West Harbour railyard retaining wall (For the upcoming 3rd track) that's about to be built. Yet another Metrolinx document pointing to all-day going to West Harbour. All of this will be finished before the 2018 election. So technical capacity of all-day West Harbour is all but assured, all down to a signature, once Metrolinx nicely says "Please" to CN, with a contract. Little tidbits may need optimizing (e.g. track optimizations between West Harbour, Confederation GO, and Lewis Yard) but none of this is unfunded or prone to 2018 cancellation. Politically, pre-announcing all-day 2-way should be an easy shoo-in to do before the 2018 election to simply activate all-day 2-way GO service by 2018, only 3 years late of the 2015 Ontario promise (but within the term of an elected). On the other hand, a form of announcement would be very healthy to strengthen the Hamilton LRT city council vote. The importance of the A-Line LRT just dramatically increased in importance, due to the need for connecting Toronto-Hamilton train service, to serve the Hamilton-Niagara train transfer.